Queen Creek originated as a vast agricultural area known as the Rittenhouse community. Street names come from the original families that developed the area. Finally incorporated in 1989, Queen Creek residents have a respect for the outdoors, are family oriented, and love their farms. Queen Creek has rapidly evolved into a destination city for many who seek modern amenities with a country feel. With a population of approximately 33,649, Queen Creek is a family-oriented community with rural character, an expanding infrastructure, and stable economy. Queen Creek's amenities include the WORLD FAMOUS Olive Mill, Schnepf Farms, Shopping, Equestrian activities, and San Tan Regional Park. 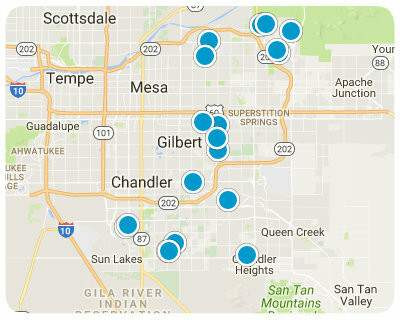 Below are ALL of the Homes for Sale and Recently Sold in Queen Creek AZ from our Realtor MLS UPDATED EVERY 5 Minutes! That means EVERY home from EVERY Real Estate Company that is currently for Sale. You can also view ALL Homes for Sale in Queen Creek, Queen Creek Condos, Queen Creek Foreclosures, Queen Creek Short Sales, Queen Creek Townhomes and Luxury homes in Queen Creek. You can filter your search at the top by price, size, etc. Check out the popular 1-Click searches like Queen Creek Homes for Sale with a Pool or Horse Property for Sale in Queen Creek Arizona.